Looking for the ultimate office shoe? Say hello to Sofia! Smart, soft, and super cool, if you’re going to be on your feet all day these Sofia is the perfect shoe for you. 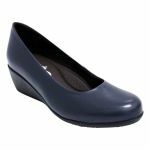 We love its simple shape and low wedge heel, which means your feet will be able to keep going as long as you do.